Cottenham is a village of some 5,000 people about six miles north of Cambridge, on the edge of the Fens. Despite recent major growth it maintains a strong identity, with many mid C19th villa and terraced houses, built in local buff brick, lining the long High Street. The Cottenham Village Design Group was formed in 1993, with assistance from the Countryside Commission, to give local people a voice in helping to protect and enhance the Village and its environment in the face of change and expansion. The Cottenham Village Design Statement aims to provide a framework within which development can contribute positively to Cottenham's future. After extensive consultation, the Design Group first published the Design Statement in 1994. During 2007, the Group undertook further consultation to update the Statement. 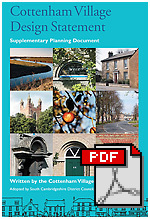 The revised Statement was adopted by South Cambridgeshire District Council as a Supplementary Planning Document in November 2007. The Design Group continues to provide a forum for local people to discuss design, planning and development, holding talks and other events aimed at raising awareness of these issues. The Group also comments on planning applications in the light of the Village Design Statement. You can see our full Constitution here and view minutes of committee meetings here (from July 2008). The Design Group is a partner in the Cottenham Environment Audit Group, assessing the character of the local landscape. The Audit Group's website is at www.cvdg.org/ceag - it is presently under construction, but any comments on the draft are welcome. The Audit Group commissioned a series of photographs by Richard Heeps, which were exhibited in the village on 23-24 October - over 300 people attended. You can view Richard's photos on the website.